The Galaxy S series of Android handsets have strangely been without a Froyo update. It was really the only new “superphone” that was still waiting for an official Android 2.2 update. That all changes as of today. 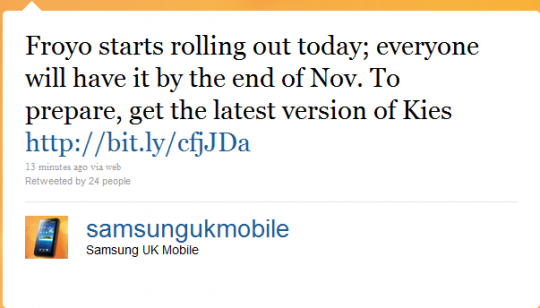 In a surprising tweet from Samsung UK, they announced that they would begin to roll out Froyo to the Galaxy S. They expect to have all phones updated by the end of the month. Earlier today, Samsung also announced that the Froyo update for South Korean Galaxy S owners would be available by next week. Galaxy S owners in the U.S. don’t really get anything out of this news, there is no word yet from Samsung or any of the 4 major carriers that currently have Galaxy S phones in their lineups. If anything, I guess it could be taken as a good sign. Samsung also points out that if you want to prepare for this update, you gotta have the latest version of their desktop software, Samsung Kies, installed. Unfortunately it’s only available for Windows. Anyone who hasn’t gotten the update yet, just sit tight you got the whole month.